A new year has started and it's time to plan a new season of our travel calendar. We would like to be even more active in traveling the world and visiting gaming and transportation industry expos and events. Ever since we built our custom SCS Sim Trailer, the impact factor that we can deliver on the various shows has grown massively! Being on the road allows us to meet many of you from our community and cross paths with a wide range of industry representatives which can lead to new and exciting opportunities. Everywhere we visit, we are always met with positive responses. Especially if we bring along our Sim Trailer, we always have a lot of visitors interested in trying our games on our motions seats or wanting to meet up with our On The Road crew. And we love meeting you! 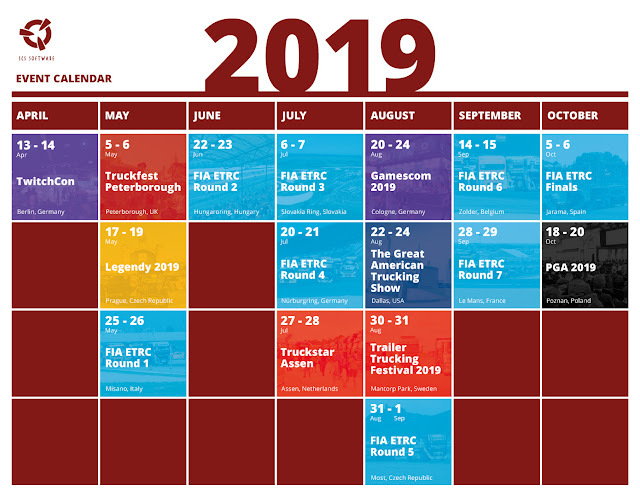 That's why we thought it would be a good idea to inform our fan base in advance and to share with you our tentative events calendar. And for 2019 we have a quite the list of 'to-visit' events. Keep in mind that some of these events are still being planned, and it may be that changes are made to our schedule. 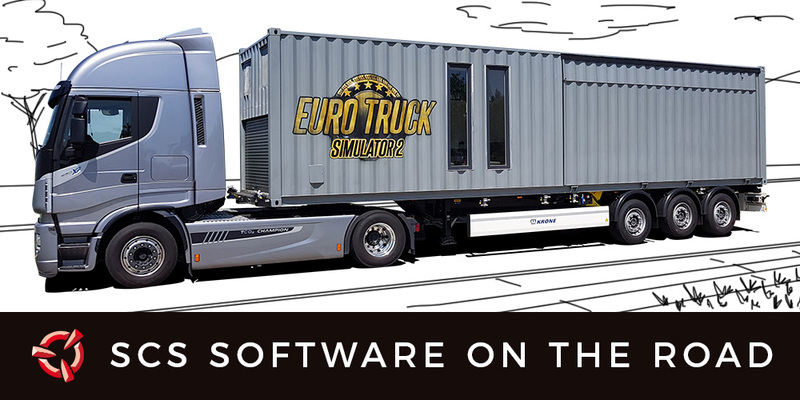 We cannot make it everywhere with the Sim Trailer, there are just too many places to go, packed too tightly in the calendar. We expect to organize some of the shows in partnerships with our friends from the transportation industry, but anyway, a core team from SCS should participate in all the events listed below. Keep an eye on our blog and social media profiles and we'll keep you updated. Check out our current schedule below, we might be travelling to an event near you! Last year we also enlisted the help of some of our local fans willing to help us on some of these events. We think it's a great way to connect with a few of our most loyal fans and offer them a very unique (and also paid) experience. If you would like to become a part of our crew for a weekend, please let us know. Successful candidates are 18+, native speakers of the region of a given event, have great social skills, they should be knowledgeable players of our games and active members of the fan community, ideally with a history of involvement with our betas, or perhaps recognised creators from the modding community. If you are free for two days of your time, have the skill and the passion to become a "roadie" and become embedded into our crew, please get in touch with us by mail on ontheroad@scssoft.com.